The Patriot brand is known more widely for making flash drives, SSDs, and RAM. On the 24th of October last year, they announced a new gaming keyboard with RGB backlighting – the Viper V765. It will be the next model in the Viper gaming series, which includes not only keyboards, but also mice, headphones, and other accessories. The V765 is, next to the V760, a keyboard designed for intermediate users, which means that it offers not only basic but also some more advanced functions, while keeping the price reasonable. The Patriot Viper V765 is priced at only USD 99, and for this amount you get Kailh White Box mechanical switches, water resistance, RGB backlighting, and a detachable magnetic wrist rest – which sounds like a good package. Ah, Aimpad technology! I have been wanting to try it out for a while now, having read references of the Aimpad analog control input mechanism with mechanical keyboards over three years ago. I referenced it in my review of the Roccat Isku+ Force FX as well, a membrane keyboard that used pressure sensitivity to drive a rudimentary form of analog control. Then came the very impressive Wooting One with optical switches for a satisfactory analog control experience on the entire TKL form factor keyboard. That required new switch designs, however, and Aimpad’s compatibility with many existing switches offered a viable alternative as well. Cooler Master partnered with Aimpad, first via a working prototype using their erstwhile Rapidfire keyboard and then for more proofs of concept at CES 2018. Well, it is now 2019, and we are finally here with a retail keyboard. Say hello to the Cooler Master MK850. XPG is the gaming division of ADATA, and has been manufacturing high performance computer peripherals for gamers and enthusiasts since 2010. XPG keeps close contact with the enthusiast market to determine their needs and develop the appropriate devices. Today, we are looking at their INFAREX K20 mechanical gaming keyboard that is available for $44.99 shipped. MSI recently launched two new high-end gaming keyboards, the full-size Vigor GK80 and its tenkeyless sibling, the Vigor GK70, which we’re reviewing today. Pricing comes in at £160 and £130 respectively, earmarking them as premium models. As such, it’s no surprise to learn that they come with a full set of mechanical switches and per-key RGB lighting. EVGA has gained a lot of familiarity and brand recognition as a manufacturer of graphics cards featuring NVIDIA GPU’s, but the California-based company produces other products designed for PC enthusiasts and gamers. 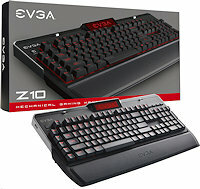 Having been teased for years now, the EVGA Z10 Mechanical Gaming Keyboards is the very first entry into the keyboard market from the longtime manufacturer of graphics card, motherboards and power supplies. Since graphics cards tend to carry less profit margin than peripherals, it is not surprising to see a manufacturer like EVGA try to expand into other markets, as competitive as they already are. Whether EVGA can make a successful entry in the keyboard market remains to be seen, but I am always happy to see more competition, as it only gives the consumers more choice. ROCCAT’s Horde AIMO keyboard introduces a real horde of features, which fits the name. Be it their Membranical switches that combine features from membrane and mechanical switches, innovating AIMO intelligent lighting, or the tuning wheel that can be used for multiple functions easily – it offers something to get everyone interested. The ZM-K900M replaces the ZM-K700M (which we reviewed earlier) as Zalman’s flagship keyboard. Adding in more lighting options and switch choices, the K900M expands on the market that the K700M targeted. The keyboard is still obviously aimed at gamers, with flashy visuals and gamer-typical marketing features such as n-key rollover (NKRO) and a high polling rate, but the addition of clicky (Blue) and tactile (Brown) options may actually please gamers disappointed at the Cherry MX Red-only K700M. Have you ever met someone for the first time and felt like you hit it off with that person right away? I had that feeling with EpicGear at CES 2017. To be fair, they had shiny new tech and that kind of thing usually happens with my extroverted personality anyways. Still, EG had an impressive CES display and now we get the opportunity to take an up close and personal look at their equipment. EG is a subsidiary of Geil, who you probably recognize for the RAM products. EG however, is specializing in gaming peripherals and I like the concepts they are trying to succeed on. Today we’re going to start the reviews with the Defiant Keyboard and the MMS Mechanical Keyswitches. That’s because we’ll also have a mouse, a cable manager and headset reviews coming shortly hereafter. It seems like EG is offering some great options in the gaming peripheral market, but we’ll need to take a closer look to really get a feel for how “Epic” their gear actually is. While I’m not worried about their chances, let’s first take a look at a beautiful logo I cropped out of the website and a quick statement about the company. By the way, did you know GeIL was an acronym? It was news for me as well. We review the KM570 MX mechanical keyboard from the G.Skill gaming series. The unit is affordable and has been fitted with Cherry MX (in our case) red switches. It is a keyboard that offers value for money and doesn’t go all berserk with LED activity. Just subtle red back-lit keys and if you want to, you can animate them. The G213 Prodigy is one third of Logitech’s Prodigy series; a collection of products targeting the widest possible scope of gamers seeking functional features. This doesn’t sound the most captivating of offerings, but we were surprised at the punchy gaming performance offered by the G403 Prodigy mouse. Let’s see if the G213 can enhance our opinion of the series.